The goal of this project it to build a cheap, small and portable Allstar base station node that can be used in a hotel room or some other travel scenario, such as inside an RV at camp. The node should be self-contained and be powered from a mobile power supply. (In my case a 12V cigarette lighter socket). The project should be as close to an appliance as possible (i.e. self-contained). The only external interfaces needed should be power, and a Wi-Fi internet connection. I highly suggest that you read at least the first 4 parts of this series before you begin building your own Portable AllStar Hostspot as described. You will need certain skills (soldering, Raspberry Pi setup) and parts (Raspberry Pi, BF888s radio, Programming cable, Resistors, Diodes, Transistor) on hand to complete this project. This series of articles is a guide rather than a complete step by step proceedure. Since many of the details of setting up an Allstar Node are described elsewhere on the net, I am not duplicating the same information. When in doubt, visit HamVOIP.com as they have the most up to date info available. When traveling in my RV, I want to remain in contact with distant ham friends who can connect with me via Allstar & Echolink. 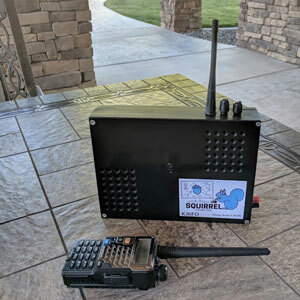 As long as I have a good cell signal on my phone, I can use the Wi-Fi hot spot feature to connect my portable node to the internet. The project described below allows me to achieve this goal. Just plug the node into my dash power, connect up and talk on a handheld radio around camp. Allstar Link (Allstar for short) is a network of radio “nodes” that can be connected via the internet to form larger communication circuits that enables you to extend your communication range all over the planet. For reference, Echolink is a similar technology, however Allstar has some extra features that make it able to become a portable solution. Allstar even inter-operates with Echolink, so you can have the best of both worlds. Allstar is an open source project, based on VOIP telephony technology that has been adapted to radios. Allstar nodes are traditionally either repeaters or base stations that are connected to the Allstar Network via the internet. By connecting one or more nodes you can extend your local node (The one you are in radio contact with) to a broader reach across the planet. One of the advantages of the Allstar network is that you can connect multiple nodes together. This allows you, for example, to build a networked repeater where coverage can extend over a larger area, than might be available to a point to point type network. 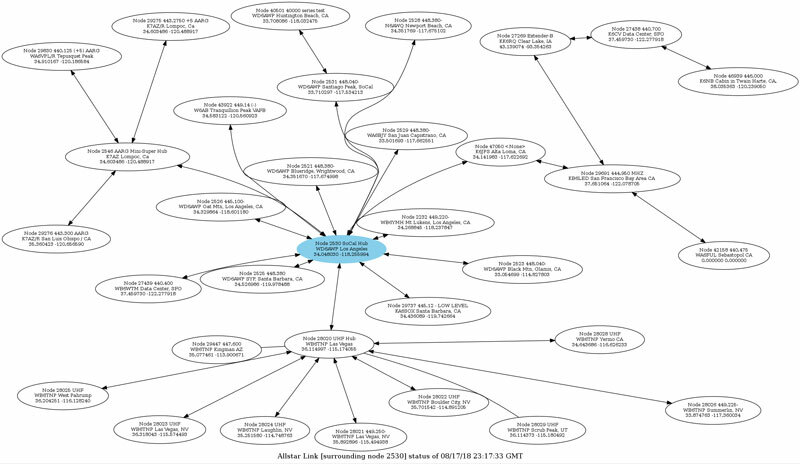 Allstar Network Bubble diagram for the So-Cal Hub node. Each bubble is an interconnected Allstar node. The Allstar system is run on a low-cost single board computer such as a Raspberry Pi model 3 (The current best choice). Running on a small single board computer consumes less power and is much smaller physically than a PC type computer. What is Amateur (aka Ham) Radio? Warning: This project involves transmitting signals via radio. Learn and observe all of your local laws regarding radio transmission. An Allstar node is build from a Radio, A computer (Raspberry Pi) and a sound card interface. Although the sound card interface can be modified with some extra circuitry, I elected to put this extra “stuff” on a separate board, with a few basic components to make it easier to solder and route wires. The HamVOIP (https://hamvoip.org/) web site documents a number of projects related to this one, however the info is contained in separate guides and I have pulled this information into a single guide to make the build easier to follow. Making this build as an appliance also requires some changes from other projects that have been documented so my design is slightly different from others documented projects. How to modify a sound card FOB for Allstar. How to connect FOB, Radio and power together. Wrapping up the project in a portable box. The HamVOIP.org site has a lot of useful information and you can refer to it for the setup of the Allstar node software. Let’s begin with modifying the BaoFeng BF888s radio….